Nobody, without knowing Francesco Villa, would think that who today appears as an over-eighty years old sportive and affable was in his youth a technician and pilot of Ducati and Mondial, and that subsequently founded his own and namesake company, the Moto Villa. Born in the locality of Castelnuovo Rangone (Modena) on February 5, 1933 by a family of farmers, Francesco began working in 1955 at Ducati in Bologna as a mechanic inside the racing department, directed by Ing. Taglioni. The Ducati at that time was developing the 100cc and 125cc SOHC that with the name of “Marianna” took in the years to come many and important successes in the national and international motorcycling competitions. Francesco was an enterprising and passionate young man and when Ing. 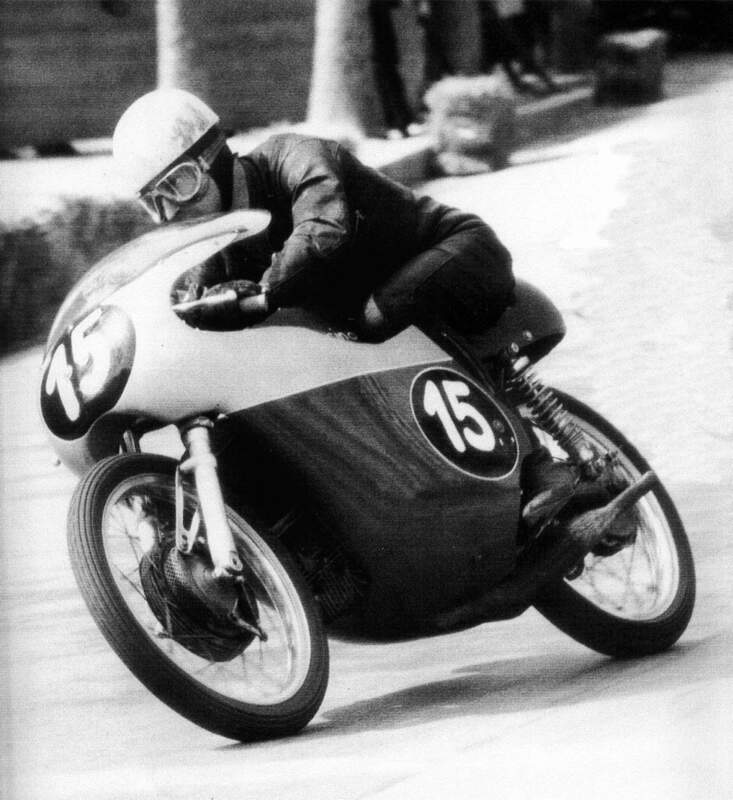 Taglioni learned that the young mechanic had already embarked on some motorcycle races with brilliant results (1st place at Maranello-Serramazzoni of 1954 on Mi-Val 125 and 12th at the final race UCMI Cup in Monza), he wanted to include him in the Ducati racing team as a pilot. With the 100cc of BorgoPanigale in ‘ 55 Francesco wins in Perugia, Lugo and Rimini, finishing second to the Motogiro (winning 4 stages), to the Milano-Taranto and to the Imola Grand Prix. These statements will lead Francesco to win the title of Italian Champion G.P. Juniors 1955 Cat. 100cc. In ‘ 56 Francesco won the Italian Championship G.P. Juniors 125 cc participating in the three races in the calendar on three different bikes: the MV-Agusta 125 DOHC, the Ducati 125 SOHC and the Mondial 125 DOHC. In the same year he is second to the Italian Championship G.P. Junior 100cc. In this category, on the Ducati 100cc he is second to the Motogiro and wins again on several occasions but at the end of the season Francesco moved to Mondial as a motor technician in the racing department and continues to the Mondial his sporting career. In ‘ 57 on Mondial 125 DOHC Francesco wins the G.P. of Modena and with the Mondial 175 DOHC the first stage of Motogiro, in addition to numerous other statements. At the end of 1957 Guzzi, Gilera and Mondial are holding a pact of abstention from competitions and Francesco returns to Ducati, where they welcome him with great benevolence. In the ‘ 58 with the Ducati 125 cc single cylinder Francesco wins in Messina and Lago di Ganzirri, and with the twin-cylinder Francesco ranked third at the Grand Prix of the Nations in Monza and wins the International Sport Trophy with both the 125 cc and the 175 cc classes. In ‘ 59 with the Ducati 175 SOHC and 125 SOHC Francesco wins at Monza, Firenze, Locarno, Morciano di Romagna and Gallarate. In 1960 Francesco was commissioned by the Ducati to make a transfer to the United States because the U.S. importer had decided to call all the Ducati Elite 200 sold for a defect in the clutch and had requested the Company to send a technician who would had to replace the defected details. During the work, speaking with some importer mechanics, Francesco confided to them that he was also interested in competitions. Immediately the importer proposed to suspend the work on the Elite, who would continue his mechanics, and participate in some competitions of promotional character. Francesco agreed and in the next two months participated with a Ducati 175 SOHC to many races winning four of them and on two occasions finishing second, beginning to spread in American land the image of Ducati, a small Italian bike, light and powerful, able to beat the “Yankee” motorcycles of even much larger engines. Back in Italy, Francesco with Alfredo Balboni ranks first overall at the “24 Hours of Montjuch”, in Spanish land, on the Ducati 175 SOHC. A race built by accumulating advantage on the motorcycles of larger engines during the night in the rain and skilfully administered in the second part of the race, thanks to the lower consumption of small 175cc which carries out less pit-stops of competitors and saving precious time. An important and prestigious victory for Ducati and for Francesco that will replicate the success a few years later with Montesa. Francesco in ‘ 60 will also impose in G.P. of Turin and Gallarate capturing brilliant results on many other occasions. In 1961 Francesco will still perform some races with Ducati, bringing back also some amazing statements such as that of G.P. of Gallarate where Francesco won both the 125 cc and 175 cc.races, however the 1961 is remembered as the year that marks the return of Francesco to Mondial: Count Boselli, owner of Mondial, considering ended the pact of abstention signed in ‘ 57, he wanted to reorganize his own racing department foreseeing a small production of racing bikes for sale to private pilotes and Francesco was designated as the manager of this project, accompanied by some valid technicians. With the “old” 125 DOHC Francesco conquer the Italian G.P. Championship Seniores class 125 cc in 1961, 1962 and 1963. In 1964 Francesco will introduce the two-stroke engine, being among the first to perceive its great potential in the field of racing. The debut of the first Mondial 2 stroke took place on the occasion of the G.P. of Modena, where Francesco had to retire when he was in the lead, for the breaking of the electric cable to the condenser, a trivial electrical failure. In 1965 Francesco won the Italian G.P. Championship Seniores 125 cc with Mondial 2 strokes of his own construction and sketches immediately an updated model, with a slimmer and lighter engine, but it is not endorsed by Count Boselli which is already widely payed for the ten world titles won by their bikes. This new bike, called Beccaccino (Snipe), will be used for the G.P. of Vallelunga by the brother of Francesco, Walter, in private form, after obtaining permission to participate from Count Agusta (since Walter that year was official pilot of MV Agusta) . The race, the last test valid for the Italian G.P. Championship of ‘ 65, was very daring and ended with a slip of Francesco while he was in the lead, the fall of Giuseppe Mandolini on Mondial that followed him and the victory of Walter on Beccaccino. Count Boselli doubted always (wrongly) of a plot of Francesco, which he said would have slipped on purpose to favor the victory of his brother Walter who won on the bike of their own construction. Francesco, who had undergone the hesitation of Count Boselli before his new project, resolved to divide his own way from that of the Mondial. 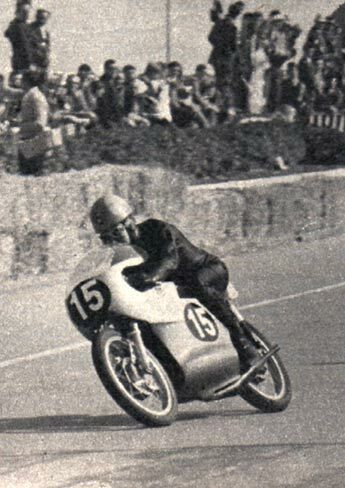 With the Beccaccino Francesco still participated in some minor races until February 1966, when at a race on the circuit of Alicante in Spain, Francesco is ranked second behind the Honda of Ralph Bryans. Some administrators of Montesa, present at the race, showed Francesco the intention to buy his bike and the project. The agreement with Montesa was signed a few days later, and envisaged the collaboration of Francesco in the construction of some motorcycles 125 cc and 250 cc to be allocated to the competitions. For all the 1966 and 1967 Francesco, in collaboration with Walter, worked on this project realizing in his workshop of Modena le Montesa 125 cc with two-stroke engine single-horizontal cylinder and the Montesa 250 cc two-stroke two-horizontal cylinders, both with mixed air-water cooling. Francesco and Walter (and some other riders) will use that bikes in different competitions of those years gaining important affirmations. Francesco will win with the 125 in Madrid and Jerez, while Walter in 1967 will also win the Italian G.P. Championship Seniores class 125 cc. The 1968 marks the end of the agreement of Francesco Villa with the Montesa and the beginning of the activity of builder “in his own” in the true sense of the word. Francesco aided by Walter, realizes a motorcycle with single-vertical-cylinder engine 125 cc with rotary valve, water cooling and oiled clutch, called Villa 125 PR with a power of about 30 hp at 11,500 rpm. Presented in mid-1968 (but the projects was from the end of ‘ 67), the bike initially adopted some details that the Villa brothers had made for “their” Montesa, as the fairing. The chassis and the engine immediately benefited from several improvements: for example, initially foreseen with the “forward” exhaust, soon the PR engine will be updated by presenting a cylinder with the exhaust turned backwards. In addition, at the end of the ‘ 68, Francesco began to develop a 250 cc engine with a rotary valve inlet and air cooling, taking as its base the 125 PR engine. Credited with about 50 hp at 10,500 rpm, this new 250 cc engine went to equip motorcycles whose chassis follows faithfully to the 125, except for the larger wheels and brakes. Initially employed by Walter, the Villa 250 PR was later used by some other riders, benefiting, like the 125 PR, of substantial improvements such as the adoption of the multidisc dry clutch and the electronic ignition in place of the plated dots. 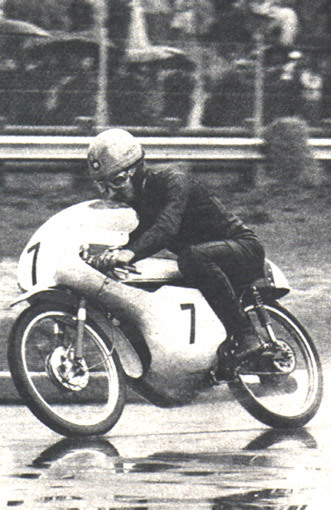 On 1968 will see Walter Villa conquer the Italian championship speed 125 seniores, followed by Francesco. The two brothers, with the homonymous motorcycles began to capture more than encouraging results. In addition to the construction of the Villa 250 PR, which had the base of the engine in common with the 125, Francesco Villa set itself the objective of paralleling a 250 cc four horizontal cylinders arranged in a framework, placing a rotary valve, ignition Electronics and seven-speed gearbox. Unfortunately, the development of this bike began just when the International Motorcycle Federation decided to reduce the maximum number of cylinders to two and six the maximum number of gears, both for motorcycles 125 and 250 cc. Nipped in the bud, the career of the 4 cylinders will culminate with the participation in the trials of the Grand Prix of the Nations of 1969 at Imola track where, for problems of tuning, the bike will carry out only the tests, while in the race Walter Villa will use the single-cylinder 250 PR. Also the 1969 will be a very important year for the newborn Moto Villa that conquers the Italian Manufacturer Championship 125 cc Seniores while Francesco is third in the Italian G.P. 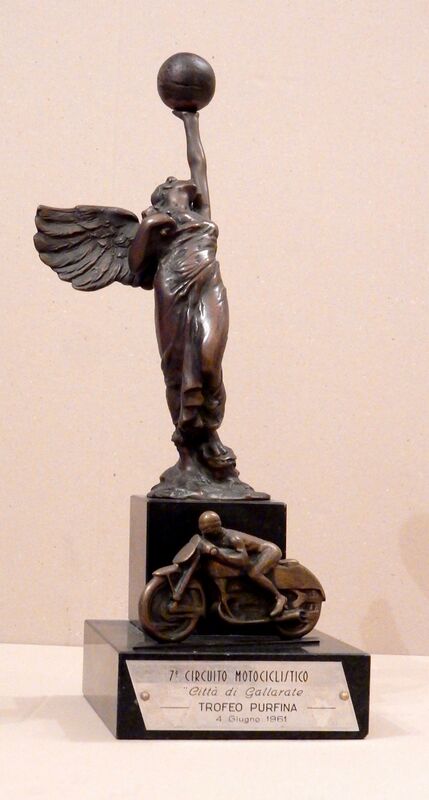 Championship 50 cc (thanks also to the victory of the G.P. of Modena on a Honda and the third place in G.P. of Riccione on a Suzuki) and Walter 4th in the Italian G.P. Championship 125 seniores. Built in a single model and brought to the race exclusively by Walter Villa, this bike will make brilliant appearances since June of 1970. Although taking good results, such as the victory at the steel circuit in Terni, this bike will never be able to fully demonstrate its enormous potential. Also of that year the construction of a 50 cc to be used in the races of G.P. Junior with which the brother of Francesco and Walter, Romano, caught brilliant results before dying as a result of a traffic accident. On the basis of the 250 twin-cylinder V horizontal, in 1971 the Villa brothers developed a 125 with the same motor setting with the intent to entrust it in the race to the young Claudio Lusuardi who at that time was a motorist at their workshop and who was taking care of the development of the newborn 50 from Grand Prix, a single cylinder horizontal with frame in tubes. The Italian G.P. Championship 125 Seniores of 1971 will close with Walter Villa in second position and Otello Buscherini in third, both on the “old” Villa 125 PR. The succession of continuous news in the regulations of the G.P. Championships had now become untenable for a home manufacturer “artisan” like Moto Villa. This was the cause of the disappearance of many other small builders from the circus of G.P., and the championship races soon became almost exclusive terrain of the emerging Japanese builders, Yamaha, Honda and Suzuki before all, that with their power they could easily steer the regulations to their liking with the clear intention of eliminating the smaller competitors who could provide a lot of hassle with a few means. Francesco understands very well that the times are changing and gives a turn to his small business, beginning to aim more and more on the construction of models for off-road (Cross and Enduro). The 1972 marks the retirement of Francesco Villa from competitions, now more engaged in production than in the competition. In that year Francesco participated only the G.P. of Modena. The first realization of Francesco in the field of road bikes were a 50 cc and a 125 cc that adopted engines Franco Morini. The engine of the 50 cc was the famous and widespread Morini “Turbostar”, for which Francesco had also previously prepared a processing kit as well as for the engine’s Malanca 50 cc. For the 125 cc Francesco had decided for the engine Morini after evaluating also the Sachs and Zundapp engines that however provided performance and reliability disappointing. With the realization of these motorcycles Francesco also abandoned the activity of Montesa italian importer and prepared new premises of production, moving the activity from Modena to Crespellano (Bologna). In 1973 Francesco decided to proceed with the production of his own engines for his off-road motorcycles, since Franco Morini was not very responsive to requests for modifications that Francesco forwarded to improve the performance and reliability of their engines. The first off-road motorbike made with Villa engine was the CR model, equipped with 250 cc and 450 cc engines that inherited the great care and refined technical solutions that Francesco had gained in many years in the field of G.P.. Presented at the Salone di Milano of 1973 the CR aroused great curiosity among the public and fans although it still presented some details that will be immediately improved, like the shape of the fenders. The CR in the Cross version and Enduro, he went into production at the end of 1973 and remained there until 1976, with changes also substantial to the chassis (with the adoption of different types of hubs, shock absorbers, more or less inclined, and forks), to the mechanics (in place of the “low” exhaust was adopted the “high” one that guaranteed greater performance and was also less exposed and therefore more repaired) and aesthetic (the fiberglass tank was soon replaced by an iron tank). In 1976 the new FV model was introduced. It was a bike of rare beauty and elegance equipped with engines 250 and 350 and produced up to 1978 in the versions Cross and Enduro. The motorcycles of the series FV are to be considered among the most beautiful motorcycles of that period, as well as among the most performing. These bikes won everywhere, especially on national soil, but also across borders, Canada, Australia, France. Could not list all the victories in the various leagues in the years ‘ 76, ‘ 77 and ‘ 78. Important and noteworthy is the conquest of the Italian MX Championship 250 Cadetti in 1975, 1976 and that of the Italian MX Championship 250 cc Juniors 1976 with Franco Picco. In 1977 makes its appearance the model 250 LG, very important as unknown to the majority of the public. It constitutes the link between the FV model and the incumbent MX, and allows the victory of Massimo Contini in the Italian MX Championship 250 Cadetti of 1977. Of the same period, the 125 cc, produced from 1978 both in Cross and Enduro version, a beautiful, innovative, light, maneuverable and very competitive bike that has been for many riders the springboard in the world of competitions. At the end of 1978 was presented the new MX series that will come into production in 1979 with air cooled engines from 250, 350 and 410 cc always built in both Cross and Enduro version. The MX series inherited from 125 the solution of the swingarm crossing the engine. The resin tank in place of the one in iron or aluminium of the series FV, the filter case in resin instead of the beautiful but heavy in cast aluminium, and many other details made of the MX a modern bike, light, maneuverable and competitive, placing Moto Villa among the most significant and relevant Italian and European manufacturers of those years. Initially designed with a double-cradle frame, the MX will then be equipped with a more robust single-beam chassis and the range of engines, that includes the 125, 250, 350, 410 and the new and scope 480 cc, will be completed. The MX series was, after the FV, the other great bestseller of the Moto Villa, and it is impossible to list all the victories in the various championships both in Italy and abroad. However, the most prestigious statement is that of Franco Picco that in 1978 with a 410 cc prototype pre-series conquers the Italian MX Championship 500 seniores, missing the following year, albeit with more points than the opponent, only for the discard mechanism. 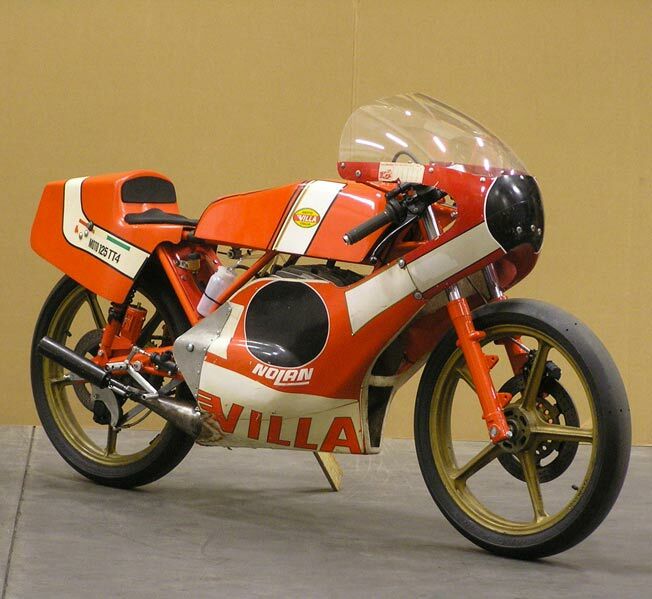 In 1981 the Moto Villa offers the new 125 TT4, a motorbike for road races, developed with the contribution of young Luca Cadalora who at that time worked as an apprentice in the workshop of Francesco Villa. The rules of the Italian TT4 Championship admitted motorcycles equipped with 125 cc engines of mass production and free cycling. The Villa engines used initially were the same ones that equipped the karts and the 125 in Cross version (engines with air cooling, piston port or reev valves). In the TT4 Championship races were several motorcycles equipped with Villa engines, applied to original Moto Villa frames or chassis of other manufacturers such as Golinelli or MBA. In 1981 Ezio Gianola on a Villa-Golinelli wins the Italian TT4 Championship, while in 1982 and 1983 is the turn of Luca Cadalora and Vittorio Gibertini, both on TT4 with original Moto Villa frame. In the off-road production, for the models 1982, the rear steel monocross suspensions were adopted (that is, with a single shock absorber instead of two) for the whole range, followed by the introduction of water cooling system also for the 250 engines. The 1982 was a very favorable year for the road-race sector: Claudio Lusuardi placed 3rd at the World G.P. Championship Seniores 50 cc and Moto Villa will be placed 4th in the World Manufacturers Championship. In Italy, as already mentioned, Luca Cadalora on Moto Villa wins the Italian TT4 Junior Championship and Moto Villa wins the Manufactures TT4 Championship. Excellent results also in karts: Moto Villa wins the Italian Kart 125 Junior Championship and the French Kart Championship 125. Another novelty for the off-road models of 1983 to which Francesco dedicates new rear suspensions made entirely of aluminium, sturdier and lighter, while the production range widens again extending also to the motorcycles to road use like Villa Italia (125 cc with air cooled), the Sebring (with liquid-cooled 125 engine) and the Daytona (fairing with liquid-cooled 125 engine), while among the new off-road models appear the new 80 cc liquid-cooled Tempesto and the amazing 495 MCA that should have been the flagship model in MX competitions: liquid-cooled and offered with front disc brake as an option, the powerful 495 MCA was unfortunately in the state of prototype since there was no time to fully express their enormous potential on the races. In 1983 Claudio Lusuardi wins the Italian G.P. Championship Seniores 50 cc with a Moto Villa equipped with aluminium monocoque box frame and Vittorio Gibertini wins the Italian TT4 Championship. From 1984 the activity of Moto Villa knows a abrupt decline, due to the competition of companies mainly Japanese, Honda, Yamaha, Suzuki and Kawasaki, which are able to propose new models at very competitive prices. On the market and in competitions there is always less space for small builders like Moto Villa that interrupts any production activity. In the following years Francesco continues to work on several projects, such as the realization of a 125 sport bike (which was to be marketed by Mondial) remained in the state of prototype, collaborates with the Oral Srl of Ing. Mauro Forghieri as a motorist at Lamborghini Engineering in the production of the 12-cylinder engines for F. 1. As well as providing specific advice in the field motorsport both in Italy and abroad for example for the Malaysian Modenas, part of the Kawasaki Group. With his brother Walter, deceased in 2002, Francesco made some Supermono, using properly developed Yamaha engines, which participate with good results at the Italian Supermono Championship in the early ‘ 90. In 2017 the writer Erio Rodeghiero from Modena, with the collaboration of Daniele Neri, publishes a book, an omnia work, entirely dedicated to Francesco, Walter, Romano and the other members of the family who have distinguished themselves in motor sports with photos, anecdotes and unpublished details. 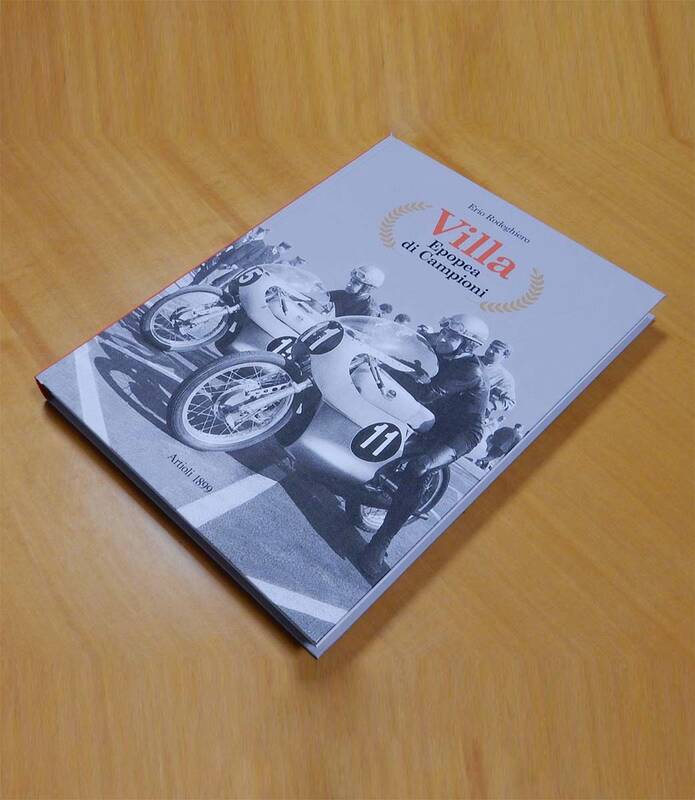 The book is available for sale and it is the fair tribute to Francesco Villa who is now considered one of the most authoritative and experienced constructors and motorists in the field of the 2-stroke engine. With its motorcycles an impressive number of riders competed and won both in Italy and abroad so much that it is impossible to list all the riders who have used in the race Moto Villa motorcycles, both in road-race and off-road. Among the best known there are certainly Walter Villa, Otello Buscherini, Chas Mortimer, Giuseppe Mandolini, Walter Scheimann, Giuliano Zera, Claudio Lusuardi, Luca Cadalora, Franco Picco, Vittorio Gibertini, Giancarlo Falappa, Italo Forni, Romano Ferrari, Giancarlo e Gianfranco Tondelli, Tommaso Lolli, Fernando Neve’s, Giuseppe Cavallero, Gian Paolo Vicarelli, Renzo e Fabio Vignudini, De Petri, Giuseppe Fazioli, Maurizio Bombarda, Lorenzo Orlando, Silvano Agostinelli, Tim Grindrod, Mariano Perozzi, Corrado Maddii, Toni Elias Senior, Luigi Dallarda, Fabrizio Realini, Gianni Degli Esposti, Carlos Serrano, Alessandro e Giorgio Orbati, Gianluca Gallingani, Franco Ulivi, Robert Sadler, Alfredo Bottarelli, Andrea Bisi, Stefano Vendemmia, Marco Ferrari, Silvano Nora, Marco Rossi, Daniele Casalini, Michele Pierucci, Vezio Tomasinelli, Ruben Zappoli, Roberto Sartini, Simone Vigini and many many others.